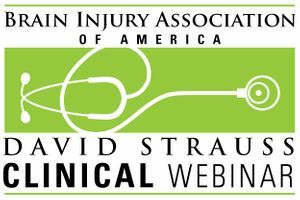 A David Strauss Memorial Clinical Lecture webinar featuring featuring Rebecca D. Eberle, M.A., CCC-SLP, BC-ANCDS, Indiana University, Department of Speech and Hearing Sciences. Aired live July 26, 2017. The 2017 David Strauss Memorial Lecture webinar series continues to focus on cognitive rehabilitation. In this presentation, Rebecca D. Eberle, M.A., CCC-SLP, BC-ANCDS, discusses the importance of understanding and addressing the social and pragmatic communication challenges that often follow acquired brain injury and how this is an important cornerstone to long-term recovery and adaptation. These impairments can vary drastically, depending on the nature of the injury and the individual factors of the person injured. The impact of social and pragmatic communication impairments may be evident in relationships and communication across all environments. Recent research has provided a better understanding of the nature of these impairments, as well as empirically based interventions. This webinar describes these impairments and discusses the impact on participation. If you would like to purchase a CD, please select "CD/Handout Package, CBIS/T Rate (Includes 1 CEU)" from the drop-down menu. Please note: The CD will be available for shipping 2-4 weeks after the webinar airs.